Help CentreUsing SuperControl Configuring my propertyHow do I add property notes? 1. Go to Properties > Edit > select property > Notes > Go. Internal booking notes: These notes will display as an alert when placing an admin booking. 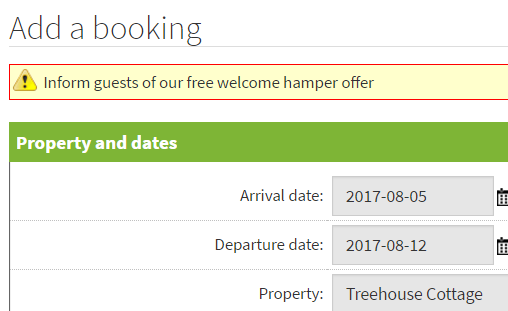 This is useful for flagging up information to colleagues for a specific property when they're placing an admin booking (eg Inform guests of our free welcome hamper offer). Date-limited internal booking notes: These notes will display as an alert when placing an admin booking <ss> for a specific period. This is useful for flagging up information to colleagues for a specific property (eg inform guests of our seasonal 10% discount offer). Enter your text and enter the date period it should display from and to. Add note: Notes added within this section will not display anywhere other than this page. You would use this section to add generic information on a property that you need to keep for reference. Upload file: You can upload documents to this area for any future reference (eg gas certificates). Prev: How can I set up property reminders? Next: How can I change my online calendar colours?